Military Nose Art - Naval Air Station Fort Lauderdale Museum Naval Air Station Fort Lauderdale, the only military Museum in Broward County, on the register of historic places. Embroidered patch from NASFLHA promotional memorabilia. A WWII Nose Art design made by Walt Disney & his crew for the military. 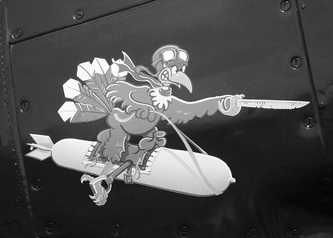 Sailor Donald Duck (Donald Fauntleroy Duck) graced the Nose Artwork of virtually every type of WWII Allied combat aircraft. The particular design shown here is a WWII US Navy insignia. 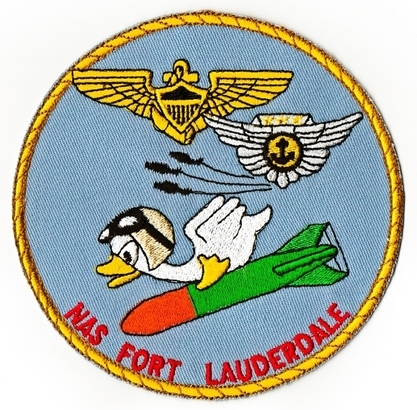 It has a Walt Disney cartoon duck with flying helmet and goggles riding a torpedo; combat crew member (with upright anchor) and wing pilot symbols, as well as 3 Avenger planes flying upwards, with the words NAS Fort Lauderdale. This embroidered patch was made for promotional purposes by NASFL Museum co-founder Ben Langley in the 1990's, who came upon a 1945 Naval Air Station Avenger article with Disney's free designs for the military. During World War II, artists working for Walt Disney created over a thousand military insignia, which were used as nose art for bombers and as unit logos. Disney artists designed logos for about ten Naval Construction units in 1943. By the end of World War II, Disney's five-man staff assigned to insignia completed over 1,200 unit insignia, never charging a fee to the military. The Disney industry was pervasive in American culture and it influenced nose art in a number of different ways. Combat crews copied Disney cartoon characters because they were suitable subjects for humorous and patriotic themes. Disney's influence also included studio artists, who joined the military and then contributed their talents to the creation of nose art. At the beginning of WWII, Walt Disney and his artists designed and painted squadron and unit insignia. Disney raised the spirit of the troops when he transformed the once staid military heraldry format created during World War I into inspired designs. 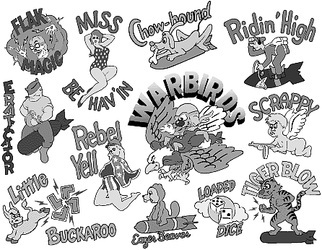 While Nose Art began for practical reasons of identifying friendly units, the practice evolved to express the individuality often constrained by the uniformity of the military, to evoke memories of home and peacetime life, and as a kind of psychological protection against the stresses of war and the probability of death. Although never officially approved, regulations against it were not enforced. The origin of Nose Art goes back to ancient times when some charioteer decorated his vehicle to distinguish it from others in battle. Throughout the ages, it has been observed that man's desire to personalize an object or make it unique is often magnified by the stress of war. During the First World War, the Red Baron and the Hat-in-the-Ring squadron succeeded in creating a unique identity that proved to be both a tactical advantage and a unifying force among squadrons and flight crews. By the Second World War, most types of aircraft were produced by the thousands. All that distinguished these planes from each other were tail numbers, stenciled on the tail for identification purposes. Like the ancient charioteers, air and ground crews set to work to create an identity for their craft and perfected what has become known as Nose Art because it was generally found on or about the nose of an aircraft. Just as the Nose Art came in all sizes, the quality of the art work varied from truly professional work to simple but no less powerful images. Most of this folk art was lost when all but a few of the planes were scrapped. Following the Second World War, Nose Art all but disappeared from US aircraft with a few exceptions in Korea and rare instances in Vietnam. WWII emblem for VB-16. Photo: archives at NAS Fort Lauderdale Museum. 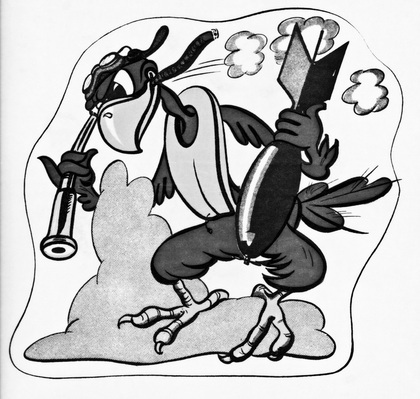 Black and white WW-2 emblem for VB-16 or "Bombing Sixteen"
The information for this particular design came from Johnny Signor, who is an avid unit emblem researcher. He studies WW-2 era flying unit emblems of the USN/USMC and USAAF. He is also a leather unit patchmaker of same. Thank you Johnny!